Mixed at Bisquiteen, Amherst, MA by Justin Pizzoferrato. Maya Miller and Michael Bernstein met in New York a decade ago, and began making music together as half of sturm und drone quartet Double Leopards a few years after that. Religious Knives came later still, away from the road and the rehearsal space, borne and nurtured in cramped apartments throughout Kings County. Beginning in 2005, the pair released a string of CD-Rs and cassettes, both on their own Heavy Tapes imprint and through the labels of kindred spirits. Steadily moving away from the psychedelic tone baths and modern industrial scrape for which the Leopards had become known, Religious Knives coursed through minimal synth oscillations and spare Kraut repetition. Mouthus' Nate Nelson joined the pair in 2006, lending a powerful presence behind the drums that shaped Religious Knives' rudimentary jams into rough-hewn, long-form paeans to tar-blackened bummer psych. Soon after that, old friend Todd Cavallo completed the quartet on bass, adding a sturdy low end and dubwise groove that lifted Religious Knives from cellar murk to black cloud puffs of bone deep alarm. An active four-piece for a little more than a year now, Religious Knives have presided over a pair of twelve-inches, a couple of collections of out of print singles and long gone burns, and one full-length. All throughout, these four have traced a path away from the clamour they once knew, bathing slight guitars, interlocking vocals, and solemn basslines in reedy organs and recalcitrant modular synths. The seemingly tin eared would call it noise, but in these eight hands such a set plays as anything but, instead a (cough) syrupy stroll in search of the ghosts of rock's classicist past. With The Door, Religious Knives have not only found those bygone days, but broken them apart. There are bookmarks to be found here, pages creased in well-worn chapters. But make no mistake - theirs is a sound tied to the here and now, a summer record for those dread days when the heat holds low and skin sticks to cheap car seats and old patio furniture. These six songs are brighter, sharper than anything that has come before, locking in tight on jugular rhythms. It's the score for disappearing neighborhoods and crumbling buildings, a hope of holding onto the past as those around us move fast to forget it. It is scent as sound, the stench of smog and sickly smoke spiraling towards the sky. It is Brooklyn, July of 2008. The sun has left us in the East, disappearing somewhere behind Jersey, leaving our borough to find the pulse of another night deep with the city's streets. 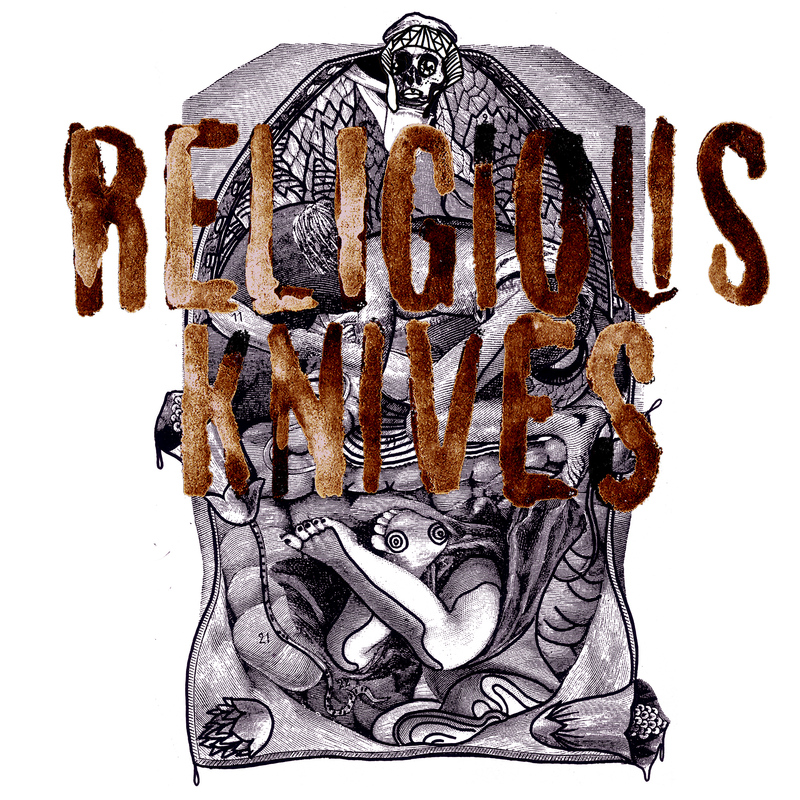 Beatcrave "Know Your NYC Bands" interview with Religious Knives' Michael Bernstein here. Wire: "...witnesses the coagulation of the four-piece into something more identifiable as an honest-to-badness rock group." Plan B: " This second full length from the Brooklyn quartet...is where they bring all the strategies they've honed exploring the while, outer tip of improv into the instrumental bear pit and tear rockn'n'roll a new one." Time Out London: "It's thrillingly brooding, psychically sticky and hypnotic stuff..."
Uncut: "It's Religious Knives' proto-PiL, art-punk minimalism and addiction to the motorik groove that mark them out as different." Baltimore City Paper: "Blades of Glory. 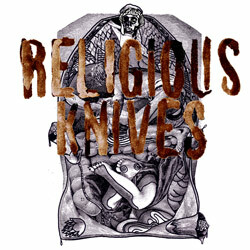 Religious Knives Spurns Players' Noise Pedigrees to Mangle Rock On Their Own Terms" Read it here. Pitchfork: "The Door is still firmly in a field of its own, offering six tracks that are equal in barbed psychedelic power yet compliment one another in such a way that this album-- although brief by the clock-- feels substantial, fully-realized, and bizarrely anthemic." more here. Dusted: "Miller’s vocals are attitude perfect – imagine defrocked nuns heading up a girl group, all full of ‘psychic trash'......The Door’s hitting me real good as a key example of how to convincingly rock without embarrassing yourself, or your audience, in the process." check it out here. Prefix Magazine: "These noises swell and change organically, like a force of nature, not an imposition of human rationality...All the foreboding darkness of the band’s name rings out here. We seem to occupy some dark, disconnected, empty landscape. We seem to be in the throes of some post-apocalyptic cult." read more here.